​Had a change of heart about your body art? Uncover skin you can be proud of with the safest and most effective treatment for unwanted tattoos. A course of 6-10 treatments is often enough to remove the tattoo depending on the colour and depth of the tattoo ink. To allow the skin to recover between Laser Tattoo Removal sessions, you can only have treatment every 6-12 weeks. We've also got access to the latest Pico Lasers in select clinics if you want even quicker results. Laser tattoo removal can cause a stinging sensation but most people do not experience high level of discomfort during the treatment. Local anaesthetic cream can be used and/or pain relief, such as paracetamol. Redness in the area is common after the procedure, but subsides quickly. The skin will be sensitive after your treatment so we recommend high-factor sun block. A combination of skin care products will be recommended to you after the treatment. You may experience a lightening or darkening of the affected skin, though in most cases this returns to normal after six months. I want to fade my tattoo so I can have a new design. How many treatments will I need? 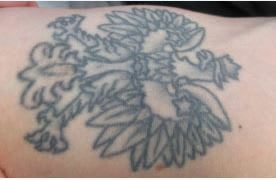 A tattoo can be faded adequately to re-cover after a couple of sessions. Your practitioner will be able to advise how many sessions you are likely to need during your consultation. Yes, it’s very safe. The laser energy is selectively absorbed by the tattoo ink only, meaning that surrounding tissues are not affected and there is no lasting damage to the skin. What's the difference between laser tattoo removal and other methods? Other tattoo removal methods do not involve lasers. We do not recommend the following methods of tattoo removal because they can cause scarring and have a high risk of infection. Acid tattoo removal - some people are now using acids, similar to those used in chemical skin peels, to burn away layers of the skin in order to get rid of their tattoos. Many health professionals strongly advise against this method. I've had my tattoo done recently. Is it easier to remove? The ink particles of the tattoo will have been injected deep into the dermis (the second layer of skin). In order to reverse this process effectively, the pigment within the skin needs to be broken down using targeted lasers. Don’t be fooled into believing that if you have a change of heart shortly after getting your tattoo it can be easily removed. How do I know tattoo removal is suitable for me? Laser tattoo removal may not be suitable for you if you have a dark skin tone; this is due to the potential of the treatment leaving a ‘ghosting’ effect, where the skin is lighter than the surrounding area. Our practitioners can assess your tattoo and determine which solution is most appropriate in a free consultation. In some cases, the most appropriate form of removal for a tattoo could be excision. This involves having the tattoo surgically removed using a scalpel. Although more invasive, it can sometimes be the most effective solution and may also be quicker than laser removal. Skn Clinics are rated 4.8 out of 5 for Tattoo Removal based on 655 reviews across all our clinics.